The New York Times bestseller and recent Eisner Award-winner for Best Limited Series THE FADE OUT by writer Ed Brubaker, artist Sean Phillips, and colorist Elizabeth Breitweiser is now available in a deluxe hardcover edition. THE FADE OUT deluxe hardcover edition collects the complete series, features bonus content, and makes the perfect gift for the holidays. THE FADE OUT marks the noir team’s most ambitious project yet. An epic noir set in the world of noir itself, THE FADE OUT takes place in the backlots and bars of Hollywood at the end of its Golden Era. A movie stuck in endless reshoots, a writer damaged from the war and lost in the bottle, a dead movie star and the lookalike hired to replace her. Nothing is what it seems in the place where only lies are true. Of particular interest are Brubaker’s own real life ties to Hollywood, both in the present and past. Currently, Brubaker is a writer on and serves as Supervising Producer for HBO’s WESTWORLD series—a series that’s garnered much buzz amongst critics as HBO’s next big Game-of-Thrones-level success. And before that, Brubaker gained notoriety for his noir revisioning of Captain America: Winter Soldier, influences of which were drawn upon for the film adaptation. Next up, Brubaker has been tapped as the writer on the forthcoming Maniac Cop remake. But Brubaker has an interesting familial tie to Old Hollywood as well, as the nephew of Golden-Globe-winning and Oscar-nominated, noir screenwriter John Paxton (Murder, My Sweet, Cornered, and Crossfire) who worked in Hollywood during the Red Scare. Two of Paxton's friends and collaborators, Adrian Scott and Edward Dmytryk were among the Hollywood Ten, the first of those ruined by the blacklist. 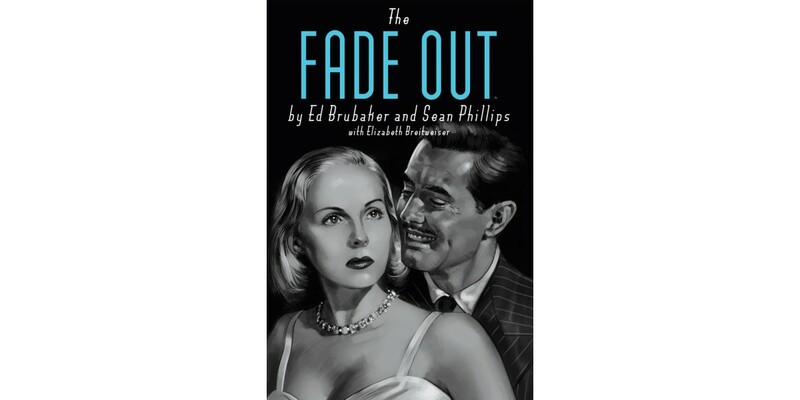 THE FADE OUT Deluxe Hardcover (ISBN: 978-1632159113) is an instant classic and a must-have. It is available in-stores now (Diamond Code JUL160832) and can be ordered online at Amazon, Barnes & Noble, IndieBound, and Indigo.